"I needed to bring a pumpkin dessert for a pumpkin-themed baby shower and I came up with this and it was a huge hit." Stir 1 cup confectioners' sugar, pumpkin, mascarpone cheese, ricotta cheese, pudding mix, and pumpkin pie spice together in a bowl until smooth. Beat cream in a chilled bowl with an electric mixer until stiff peaks form; fold into pumpkin mixture. Spoon pumpkin mixture into a resealable plastic bag and snip a 3/4-inch hole in 1 corner. Pipe pumpkin mixture into each cannoli shell. Garnish the ends with sprinkles and confectioners' sugar. You can add more vanilla pudding mix until you reach the desired consistency. 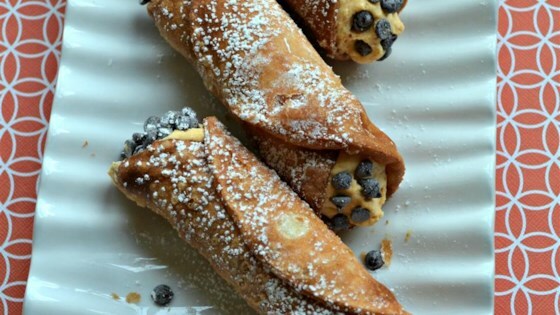 Excellent variation on traditional Cannoli. I made this for Christmas brunch and it was a huge hit with my family. I was lucky to get a taste myself. I paired it with graham crackers and we ate it as a dip instead of in canolli shells. We had a hard time finding the pre made shells.